Nava Semel, the Israeli journalist, playwright, and author and, of even greater significance, child of survivors, has written the following piece about the SS album, which, according to the Director of the Holocaust Museum, Sara Bloomfield, has prompted the most traffic ever to the museum's website. The article first appeared in Yediot Achronot on September 21. Let’s call them Ilse and Trudi. Ilse, fourth from the left in the photograph, has her hand on Trudi’s arm in an intimate gesture, and they are exchanging a joke because Trudi is laughing, beaming with happiness. Was Ilse telling her about last night’s lover, or the great party in the officers’ mess, or perhaps she was telling her how the verfluchte Jew begged for her life? 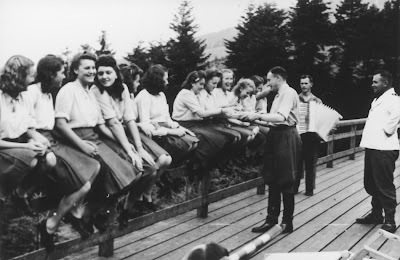 There can be no doubt that the photographer found his subjects amiable, that row of cheerful young women leaning on a rail in a rural club, against a backdrop of cypress treetops and a mountain landscape. A genial man on the side is playing the accordion for them, and another openhanded gentleman is passing among them with a tray loaded with blueberries, perhaps to sweeten their hard day’s work. Had we not known that these people were members of the Auschwitz staff, we might have thought that the photograph was taken at a workers’ committee day out in the countryside. I uttered the words, I knew, and yet I feel that I have been punched in the stomach as I see the delight of those girls on the rail – apparently SS telephone operators – brimming with youthful passion. Was the photograph taken after a bus journey, during which Ilse and her SS officer – a married man judging by the ring on his finger – wove their romantic relationship and planned to spend the night together? Trudi is looking over her shoulder, perhaps she is curious, or perhaps envious. And the album contains not one minuscule flash of regret or traces of a moral rupture in the face of the murderous machine of which they were a part with such elation. Missing from the photograph is Mimi, my mother and the mother of Shlomo my brother. For her, and the other tortured human beings, there was no room in the commemorative photographs taken by Karl Höcker. The heart and humanity of the photographer and his subjects were totally dulled, while the survivors struggle daily over and with the memory, and the pictures lying beneath the pictures are tattooed onto their secret nightmares just as they are woven in their new, rehabilitated lives. If I could speak to Ilse and Trudi – and at the same time spit in their faces – I’d tell them that Mimi has learned anew, if not to laugh, then at least to smile. I saw the album at the U.S. Holocaust Museum's website. What is particularly chilling is the subject of the blueberries. I read an account--it was either in Martin Gilbert's Holocaust or in Lawrence Ree's Auschwitz--in which a prisoner was ordered to pick blueberries. The prisoner was told that she was to do so without eating any of the fruit during this chore. And to ensure that she didn't, she was warned that she'd be examined for the telltale evidence of blueberry stains on her teeth and tongue. She'd be killed if such evidence gave her away. So, when I read about the S.S. women eating their blueberries and one showing mock dismay over her consumed portion, I figured that those blueberries likely were picked by some poor, starving prisoner who was threatened with death if he or she gave in to the temptation of eating any of them while picking them. iT'S 2.20 pm here in England, it's a bright cheerful sort of Sunday, and these SS Blueberries are getting to me. Sharons anecdote above does my inner self no good, it ruined my demeanor. Now I'm thinking about how little food it took to feed all the prisoners in Auschwitz daily, I reckon for 40 000 prisoners you'd needs 25 tonne of boiled barley, 25 tons of stewed meat offal or fish / chicken waste, 25 tons of potatos, 1 ton of linseed, 10 ton of either Maples, Peas or Lentals, 2 cwt of salt, 5 ton of waste white animal fat or lard, and 10 000 loaves of bread. These foostuffs might be crude and cheap but they were just what the prisoners needed. The cost was almost next to nothing considering the number of 'desperate prisoners they were needed for.' I think it was Langbein who said the difference between life and death was 2 ounces of meat per day. Meat being the key to camp survival. An handful of blueberries say no more?